Help us make bicycle riding normal in Australia again. In the early 1990's Australia introduced an all ages, nationwide ban on bicycle riding without a helmet. The result on normal bicycle riding has been devastating. Thousands of everyday people simply stopped riding. Only sport cycling has survived. It's now 26 years later, and despite a mountain of evidence against mandatory helmet laws , the Australian government has never actually evaluated the effect of the law and the ban is still in place. 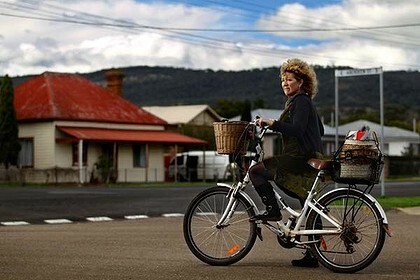 In March 2014, Sue Abbott (pictured above) was stopped and fined by South Australian police, for not wearing a bicycle helmet. (Ironically, Sue was in Adelaide attending the Velocity 2014 world cycling conference, presented by the European Cycling Federation). After 18 months and six court appearances, in November of 2015, Sue was found guilty and penalised a total of $560 (which included a "victim of crime" levy) - plus handed a criminal conviction. Sue is now a registered criminal in Australia... for not wearing a bicycle helmet! 'Freestyle Cyclists ' & 'Upright Bicycle Riders of Australia ' to help fight this ridiculous law in the courts and the parliaments of Australia. All money raised will go towards supporting victims of this law, (such as Sue) to help with the financial burden placed on them when they plead their case before the courts. No one should be labelled a criminal, just for doing something that 98% of the world are free to enjoy doing. Where ever you are in the world, if you value cycling and the freedom it brings, we'd really appreciate your help - no matter how big or small. Please add a message of support when you donate! Thanks to your generosity, we've paid out a total of $1,041 in court imposed helmet fines to date! We still have $1,267 of donations remaining and will continue to pay court imposed fines for victims of this victimless crime. Our fund is continuing to pay court costs & court imposed fines for helmet law offences in Australia. On 20/4/2016 we paid $261 to cover http://freedomcyclist.blogspot.com.au/2016/04/court-cases-coming-out-of-my-ears.html court imposed fine and costs for Sue Abbott. If you take your helmet fine to court, you can apply to this fund to be reimbursed. I love to see humanity cycling free around the world. Thus it was in my youth, and hopefully shall be again. This law provides a crutch for the government and roads agencies to do nothing for actual road safety improvements for active travellers. As the nation goes backwards on its vascular health, asking people to change their modifiable lifestyle factors and then refusing to give them the tools to do so is a complete farce. It makes me sad that Australia is in the grip of politically driven stupidity. We have laws forced on us that infringe on personal freedoms that would be laughed at in oppressive regimens around the world. And our supposedly free and investigative press are so focused on inane fluff they don't even blink as it happens! I hope one day "common sense" might make a come back and Australia will move back to the free and fun loving society we used to be.